Until quite recently the Black Prince’s “shield for peace” was regarded as an heraldic whim of that most chivalrous prince. In his Heraldic Imagination, Rodney Dennys on the contrary conjectured that such shields were presumably not uncommon in the tilt-yard.1 In the course of my research, I discovered coincidentally a number of testimonies bearing on the use of shields for peace in the Spanish Netherlands, that univocally confirm the latter hypothesis. 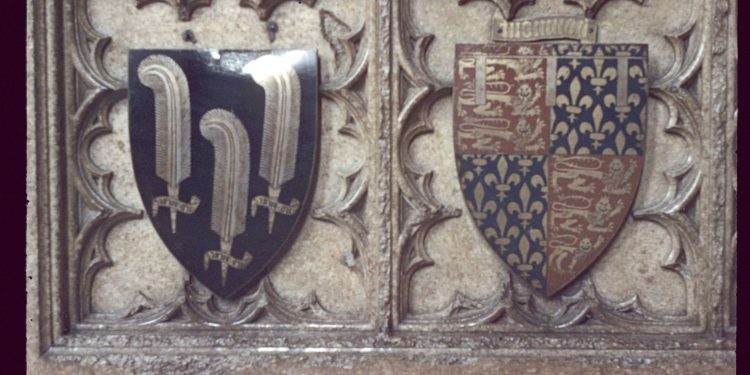 They offer furthermore an opportunity to advance a possible typology of shields for peace, as well as a likely bridge function between different means of heraldic expression. Shields for peace at memorial services. Between 1482 and 1794 only one out of twelve rulers of the Southern Netherlands died on its soil, the others expiring either in Spain or in Austria. Memorial services were held in the chief cities of the country, that lacked nothing in realism and sumptuousness but the body of the deceased.2 As the actual direction of such memorial services was one of the responsibilities of the principal king of arms, it comes as no surprise that their embellishments were predominantly of an heraldic nature. The content of the heraldic display varied throughout the period, keeping pace with political needs and the situation of the treasury. Tournament equipment was displayed as well as the equipment of war. 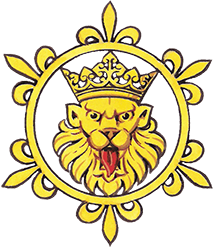 The latter (consisting of the helmet and crest, the shield, tabard, pinsel, guidon, standard and banner) was as a rule adorned with the official arms of the monarchy; whereas the first (containing a tilting helm with elaborate panache, a tilting shield [called targe] and a pinsel, guidon and standard “of the colours”) were used to show liveries, badges and devices of a strictly personal nature. Their description and analysis will clearly prove this. Shields for peace: appearance and significance. The shield for peace of the Emperor Charles V (1500-1558) is the oldest of the series. It was carried in his funeral procession and displayed in the ensuing services in Brussels on December 29th and 30th, 1558. Subsequently it was put in his cabinet d’armes,3 where it hung at least till the 1720s when André François Jaerens made a drawing of it.4 The blazon reads: Sable, a pale Or, over all issuant from waves of the sea in base Proper, two columns, imperially crowned of the last, conjoined by a scroll Argent, inscribed with: ‘plus ultra,’ Sable. The example set for Charles V was followed at the memorial service for his son Philip II (1527-1598). Shields for peace: a typology. The devices likewise have their particularities. Although the shields only have five charges on average, they look crowded. They stand on the outer edge of what is accepted as heraldic, which also explains why they require such lengthy blazoning. The sources clearly indicate that not just any member of royalty could sport a shield for peace. Through the enumeration it has already become clear that only the male half of the dynasty was regarded fit. But the Memorial Service for the Cardinal-Infant Ferdinand (1609-1641), a brother of Philip IV, proves the distinction was a bit more subtle. For him no shield for peace was displayed 11 : as a priest he was forbidden to participate in a tournament. Hence only one conclusion can be drawn: in the Spanish Netherlands shields for peace were armorial bearings of a specific form reserved for use of those of tournament rank. Dennys, Rodney, The Heraldic Imagination, London, 1975, p.41. Duerloo, Luc, De wapenkoningen in Vlaanderen en Brabant (1715-1767), memoir, Louvain, 1980, p.96-103. C.Pama, Rietstaps handboek der wapenkunde, 4th ed., Leiden, 1961, p.234; and Donald Lindsay Galbreath and Leon Jequier, Manuel du blason, Lausanne, 1977, p. 254. The Cabinet d’armes was in many respects the fore-runner of the hatchment, but it was far bigger, oblong and contained representations of the deceased’s tabard, helmet and crest, gloves, sword, spurs and four-quarters. Brussels, Service of Nobility (B.S.N. ), Herald’s Chamber, 219. f.IIIr: Cabinet d’armes of Charles V, drawing circa 1720. B.S.N. Herald’s Chamber, 215, vol.11, f. 35v: A.Colbrant, Memoir of memorial service for Ferdinand II, 1637. Ibidem, f.72v: Idem, Memoir of memorial service for don Baltazar, 1647. Michael Pastoureau, Traité d’héraldique, Paris 1979, p. 202. Jiří Louda and Michael Maclagan, Lines of Succession, London, 1981, p.261. B.S.N., Herald’s Chamber, 215, vol.11, f.112v: J. Van Den Leene, Memoir of Memorial Service for John III Sobieski, 1696. B.S.N., Herald’s Chamber. 215. vol.11, f.38r-51v: A.Colbrant. Memoir of Memorial Service for the Cardinal Infant. 1641. John Philip Brooke-Little, Boutell’s Heraldry, 6th ed.. London, 1973, p.165. Arthur Charles Fox-Davies, A Complete Guide to Heraldry, 2nd ed., London, 1929, p.459.